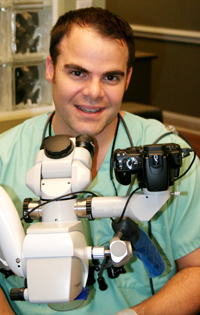 Our mission is simple: to establish excellence in endodontic therapy to our patients in the greater Charleston area. This will allow patients to experience our services and to perpetuate our reputation for being the benchmark of endodontic technology. As health care professionals, our primary goal is to provide the best endodontic care available to all patients referred to our office. We will treat each and every patient with professional respect and compassion while creating a "fun" atmosphere full of life and energy. This begins with the moment the patient calls or walks into our office and ends when the patient no longer requires our services. Our practice provides a full spectrum of Endodontic therapy, ranging from conventional root canal treatment to micro-surgical and retreatment procedures. We use the latest technological innovations in Endodontics. In our state-of-the-art practice, we utilize digital radiography, which significantly reduces radiation exposure to the patient. We also use operating microscopes during all phases of root canal procedures. I am in the Coast Guard and have had 4 root canals done by Dr. Maltezos. I would fly across the country to have him do any other root canals, if needed. Quite frankly, this is the best dental care I have ever received with zero discomfort. Everyone at Low Country Endo always tells you what is happening, there is no surprises. To hear Dr. Maltezos say "sorry, I am a perfectionist" is music to this patients ear. The best there is!!!!! I just want to thank Dr. Maltezos and his staff for their wonderful treatment! I was out of town on vacation and was having severe pain. I called the office that morning and was seen that afternoon. The staff was caring and Dr. Maltezos was excellent! I was very comfortable during the procedure. If I ever need another root canal, I might just drive back 5 hours to have Dr. Maltezos do the procedure! Thank you again for getting me in so quickly so I could enjoy the rest of my vacation! Just wanted to say I'm amazed at how quickly and professionally my visit was at your office. I was relieved on how you and your staff welcomed me and took care of my problem and pain! I just wanted to follow up and let you know my visit to your office was absolutely superb. I was treated like a member by you and your staff and they have followed up with me to be sure all was well. I experience not the slightest bit of pain or discomfort. It was a pleasure to have a root canal contrary to what Mr. Obama says!! I also told my dentist what an excellent experience I had at your office. Thank you very much. Anyway, you are very skilled as an endodontist and very attentive to your patients (not to mention your office feels more like a spa than anything else). All and all, I have been very pleased and will definitely refer people to you. Good luck with your practice.